Dr. Jennifer Cassidy is the owner of our hospital. She joined our team at Country Hills Animal Clinic in 2005 and vowed to raise the standard of advanced and affordable veterinary healthcare. Prior to joining our team, Dr Cassidy graduated U.C.I with a B.S. in Biology and a minor in Chemistry. She managed an all feline practice and was a surgical veterinary assistant at a surgery referral practice. As a native of California, Dr. Cassidy graduated from U.C Davis, School of Veterinary Medicine in 2004. She spent her internship at Advanced Veterinary Care Center for Cardiology, Internal Medicine and emergency surgery. Since coming to Country Hills Animal Clinic Dr Cassidy has worked to continue her education in Dermatology, Internal Medicine and Surgery. Outside of the office she does volunteer work once monthly with the S.C.V.M.A for the downtown dog rescue. There she helps to provide vaccinations, microchips, and basic health care for pet owners in financial need who do not have access to these services. Dr Cassidy is also a member of the Southern California Veterinary Medical Association, American Animal Hospital Association, American Association of Feline Practitioners, American Veterinary Medical Association, and the California Veterinary Medical Association. In her spare time, she enjoys gardening, hiking, and spending time with her family including her 4 legged and 2 legged children. 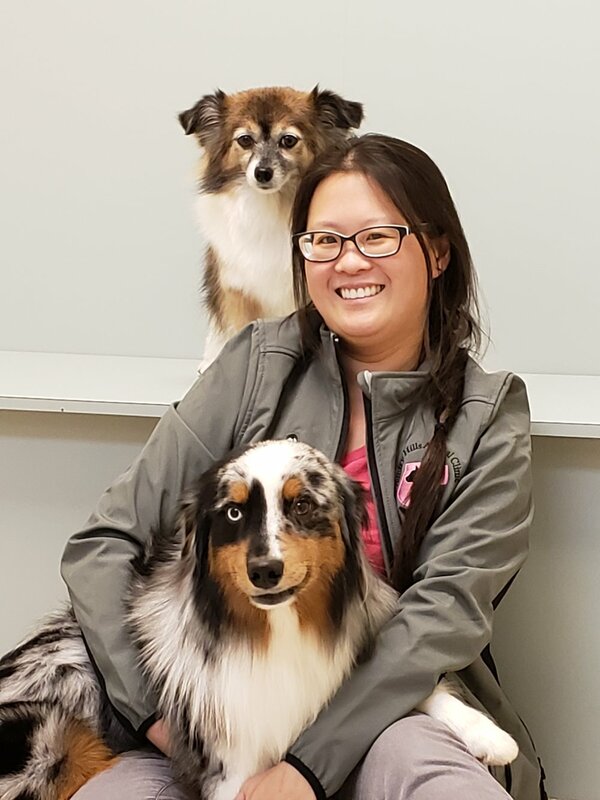 Dr. Charmaine Tong-Kaufman is a DVM graduate from the University of Guelph: Ontario Veterinary College in Canada. Originally from Toronto, she escaped the cold North and made the move to sunny California in 2012 to set up house and home. She has worked in both equine and small-animal practices with particular interests in small-animal behavior/training, pain management and nutrition. She shares her life with her husband and her 2 dogs: Cricket, a feisty Papillon/Pomeranian mix, and Tails, a Miniature American Shepherd (Miniature Australian Shepherd) - who has his natural tail! On the weekends you can find Dr. Tong-Kaufman competing in several dog sports, agility being her favorite. She also enjoys hiking, horseback riding, exploring new cities, DIY house projects, and reading Stephen King. Dr. Abigail Elliott received her DVM from Western University of Health Sciences in 2011. She then completed a small animal rotating internship at Advanced Veterinary Care Center in Lawndale. It was there that she first gained exposure to veterinary acupuncture, as many of the cats and dogs undergoing cancer therapy also went to the staff acupuncturist for pain relief. Dr. Elliott joined the staff at Country Hills Animal Clinic once her internship ended in 2012. She became a member of the International Veterinary Acupuncture Society in 2016. Her goal is to practice the best of modern evidence-based medicine while infusing it with the compassion and individually-tailored therapies of alternative medicine. Dr. Elliott lives in Harbor City with her husband, their dogs Phoebe, Freya and Brienne, and their cats Saturn, Taffeta and Napoleon. They also share their property with a delightful opossum named Anastasia. In her free time, Dr. Elliott enjoys crochet, hiking, biking, computer games, board games, and puzzles. She has yet to complete a puzzle without Phoebe eating any of the pieces. Dr. Michael J. Smith graduated from the University of Arkansas with a B.S. in Animal Nutrition and ultimately attended LSU's School of Veterinary Medicine. He moved to California in 1980 and began his practice at Country Hills Animal Clinic in 1985. During his time here, he also served as the President of the SCVMA as well as holding an officer position on the board of the Animal Health Foundation. Married with two daughters, Dr. Smith enjoys spending his free time hiking, making bamboo fishing rods and playing with his chocolate lab, Java. Dr. Smith is also available for orthopedic surgeries.